Celebrities are just like us, at least when it comes to raising kids. Many of us have experienced the throwing of the temper-tantrum and being at a loss for what to do. Tamera Mowry is sharing her experience with how she manages those embarrassing tantrums with her 2-year-old son Aden. To start we usually try the distraction method. My bag is loaded with little toy trains and Aden’s iPad for those moments when a meltdown is just beginning–you know the kind that blind sides you and begins for no reason? Yeah. This often works because whatever was frustrating him disappears when he sees something he loves (and boy does he love trains). If that doesn’t work and he’s acting out, we try putting him in the corner for a minute or two, or making him stay in his room for a short period to ‘work it out’. He’ll often come away from the corner with a cute little apology and a hug (who can resist that face?). He comes out of his room once he’s calmed down enough that we can take care of whatever set him off in the first place. 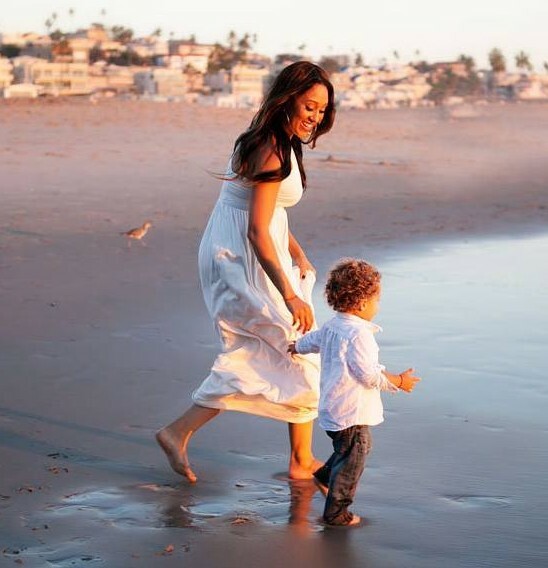 Mowry says that she’s constantly assessing the way she and her husband parent, and realizes that every child is unique. The way they learn and express themselves is so different. She also wanted to stress that patience and love are key. Tantrums are part of being two, but if we can make them less frequent, then why not!